Yes. He will definitely win by a narrow margin, and probably win by a significant margin. Josh Leinsdorf can prove it by an overwhelming preponderance of the evidence..
Joshua Leinsdorf, chief psephologist of the Institute of Election Analysis has been studying the impact of elections on government for over forty years. He has a proven record of success predicting the outcome of elections for two reasons: he is non-partisan and his approach includes understanding elections from the only perspective most people care about, their effect on government policy. Josh’s analysis is based on real world experience in politics and government, not just academic credentials. In 1963, as a senior in high school, Josh had the privilege of riding in a limousine with Vice President Lyndon and his wife Lady Bird Johnson, who had been friends of his parents in the 1930’s and ‘40’s. He grew up in Larchmont, New York, where some of his classmates were the children of United Nations diplomas and employees. In 1970, Josh correctly predicted the outcome of the British General Election. After working on Eugene McCarthy’s presidential campaign, Josh worked for New York City Mayor John V. Lindsay’s re-election campaign. He worked on polling. 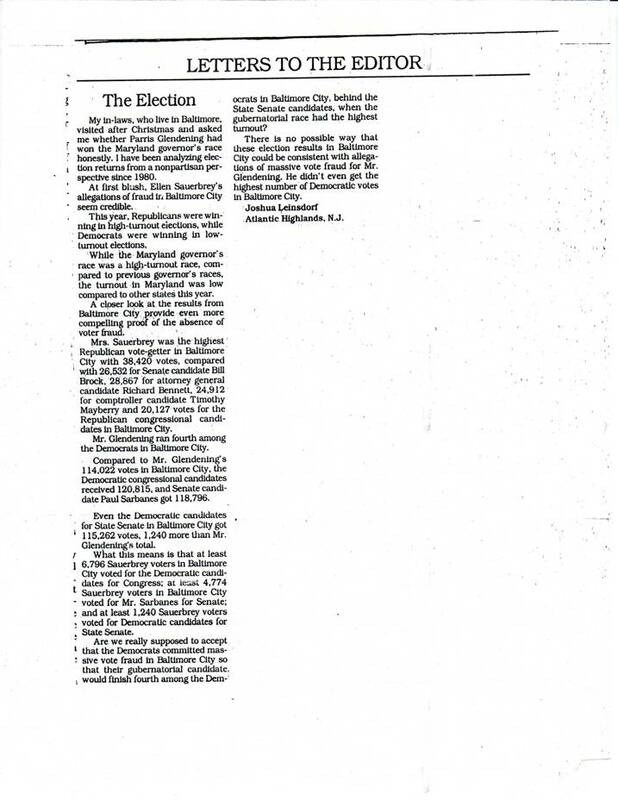 Lindsay lost the Republican primary, but Josh worked with an election lawyer, Robert B. Brady on circulating and filing the petitions for an independent line on the ballot. He also assisted with the court case which threw enough minor party candidates off the ballot so that Lindsay’s independent line would have a column of its own (don’t worry, most of the signatures on those petitions were forged, but are presumed valid unless challenged.) Years later, Josh worked for Brady and, among other things, they reapportioned the New York City Council districts under a federal court order. Lindsay won re-election on the independent line. The wife of one of the people Josh worked with on polling for Lindsay had gone to school with the wife of David Owen, the foreign minister in Harold Wilson’s Labour government. While in Europe, Josh was invited by his former manager on the polling operation to dinner at Dr. Owen’s house (he was a medical doctor) to explain the pitfalls of polling data, based on knowledge gained from the Lindsay campaign. Dr. Owen said that Wilson was considering calling a snap election because Labour was ahead in the polls. Josh explained that polls only give a snapshot of opinion at that moment, and have little predictive ability. This is especially true in a parliamentary system. Most voters do not even take their own political opinions seriously until there is something concrete they can do to act on them. Most voters, wisely, wait until the last minute to decide. In the United States, elections have fixed dates, but in a parliamentary system like Britains, voters do not start seriously considering candidates and issues until an election is called. Dr. Owen told a story about how he had gone to dinner at 10 Downing Street and found himself being gotten very drunk and agreeing to run a campaign against entering the Common Market and then taking the country in six months later. Josh’s arguments failed to impress. After the dinner, Josh continued his journey. In a public bathroom at a national historical site, Josh found written on the wall: “If you want a Niggerian for your neighbor, vote Labour.” Josh quoted this in a letter to Dr. Owen, with the comment, “Here is the real issue in the campaign and it will not appear in any opinion poll.” Labour lost the election and Wilson was replaced by Edward Heath. Josh returned to New York and was elected to Community School Board #3 in Manhattan. For the next three years, Josh was an elected official and started to understand the relationship between campaign rhetoric and subsequent government policy. François Mitterrand, the head of France’s Socialist Party, lost to Valerie Giscard D’Estaing by a narrow margin in 1974. There was a rematch in 1981. Josh saw that, contrary to the polls, Mitterrand would defeat the incumbent. He ran around advising his clients to lighten up their long French Franc positions. After Mitterrrand’s election victory, the French Franc plummeted. Difficult as it is to believe in retrospect, Reagan was trailing Mondale in the polls by 10% the December before his re-election by one of the biggest landslides in American political history. By this time, Josh wanted to leave public markers of his predications to prove the validity of his methodology. 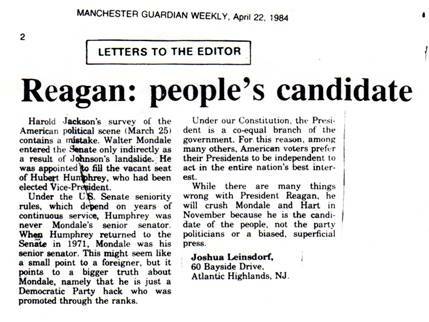 Below is a letter, published by the Manchester Guardian Weekly in April, predicting Reagan’s crushing defeat of Mondale the following November. This was the election where Josh learned that politics in New Jersey were covered better by the foreign press than by the local newspapers. 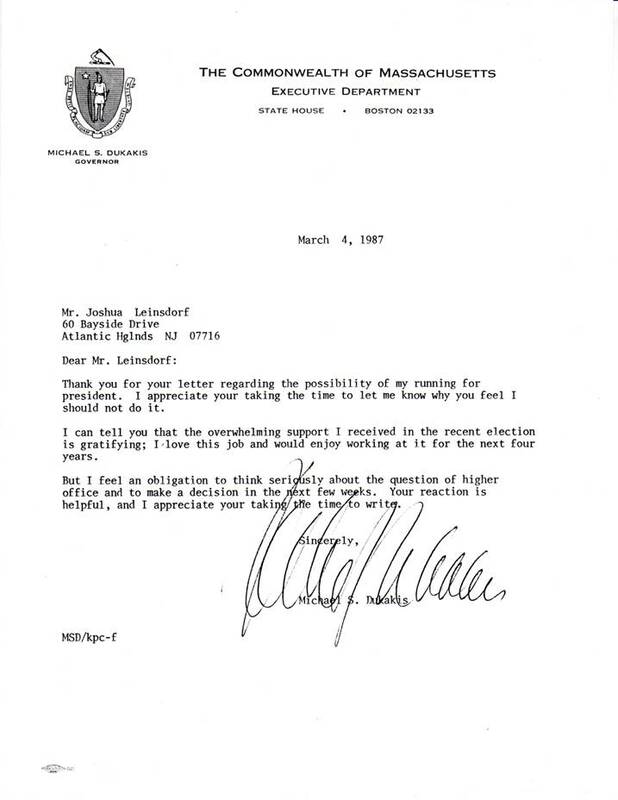 Mike Dukakis happened to be Josh’s State Representative when Josh was in high school. When Josh heard that Mike was thinking of running for president, he did his analysis and concluded that Dukakis could not win, even against a sitting Vice-President, a notoriously weak position. No sitting Vice-President had been elected president since Martin Van Buren in 1836. Josh, like many others, thought Neil Kinnock would win the British election on April 9, 1992. However, the replacement of Margaret Thatcher by Prime Minister John Major in November, 1990; when preparations for the first Gulf War were well underway, blunted Kinnock’s message for change. In the event, John Major won the 1992 election. Josh learned never to underestimate the power of war to influence events. In the last week of July, 1990, a neighbor’s son who was serving in the Marines came by to introduce Josh to his fiancé. During their talk, Josh said, “War is coming in the Middle East.” When asked, “Between who?” Josh replied, “Iraq and …” He did not know who the counterparty would be. So, when Iraq invaded Kuwait, Josh was better prepared than the Central Intelligence Agency and the Defense Intelligence Agency. Unsolicited, he wrote a one-page suggested plan for negotiating an end to the crisis and sent it to President Bush. 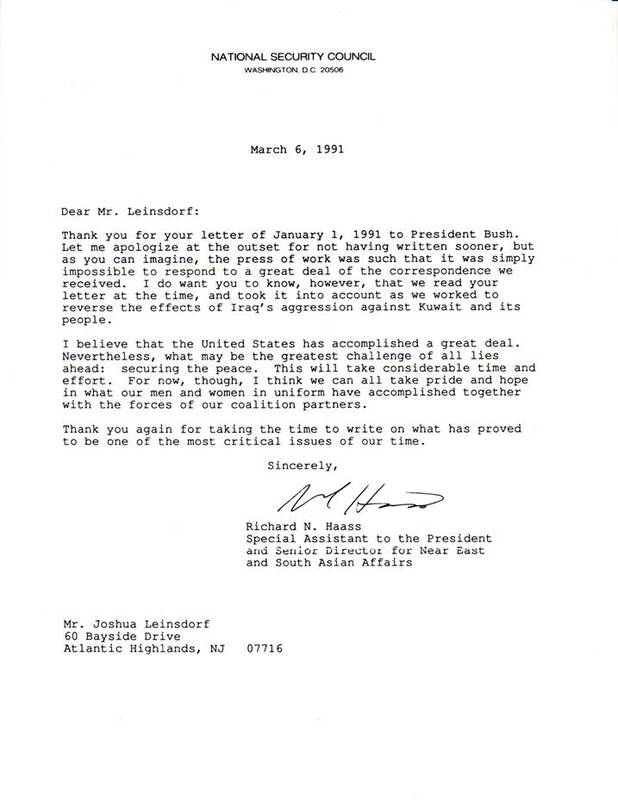 Although his plan was not adopted, after the war he received the following letter from Richard Haass, who was the head of the Middle East Desk at the National Security Council at that time. A rematch between Sauerbrey and Glendening in 1998 proved the validity of this analysis. Sauerbrey lost again. The Institute of Election Analysis website was launched in September 1997. Mr. Leinsdorf thenceforth stopped leaving markers in newspapers and posted his research on the website. The 2000 Presidential election was too close to call. In the end, Gore won the election by more than 538,000 votes, and even carried Florida with the voters. (Articles to this effect are on this website.) During the dispute over the outcome, Mr. Leinsdorf said, “If Bush is selected, the country will be at war in six months.” The reason for that comment was that Bush ran on a war platform, lost the election, but was awarded the office anyway. Americans have a tendency to play others, especially non-white foreigners, for fools. Furthermore, even though war and depression were the logical, indicated outcome of the first stolen presidential election in modern American history, few people, including Mr. Leinsdorf, want to believe that war and mass misery are on the horizon. They hope they are wrong, and are reluctant to profit from mass misery in any event. Ethical public figures should and do strive for peace and prosperity. Joshua Leinsdorf, chief psephologist of the Institute of Election Analysis will defend his thesis that Obama will win by submitting to cross examination by any group or organization, for a modest fee. The deal is that, when Obama wins, Mr. Leinsdorf will receive a substantial bonus. In 2001, Mr. Leinsdorf was elected to the first of three terms he spent on the Princeton Regional School Board in Princeton, New Jersey.